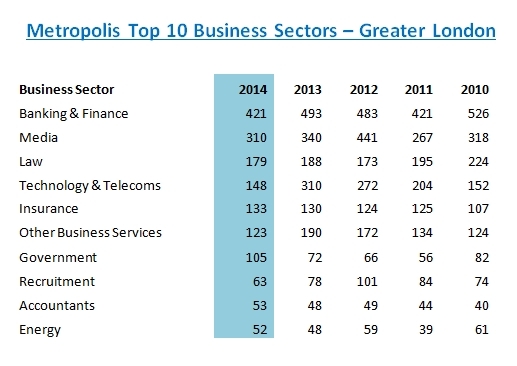 For the sixth year running, Banking and finance leads dominate the London business sector top ten. The largest search for space emerging from this sector in 2014 was a 300,000 sq ft requirement for HQ offices in London EC3, closely followed by a 200,000 sq ft office requirement in London EC2 and a similar sized requirement from a bank looking in EC4. 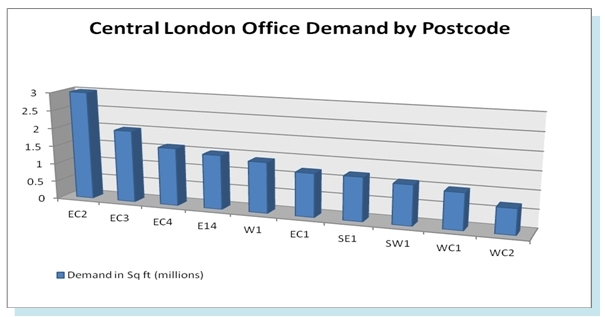 Total new office demand in London from this sector was 4m sq ft.
Office demand from hedge funds amounted to just under 250,000 sq ft, with the average requirement a search for about 10,000 sq ft and the most popular postcodes London W1, SW1 and WC2. Demand from financial investment firms was 800,000 sq ft, with the most popular postcodes London EC2, EC3 and EC4. 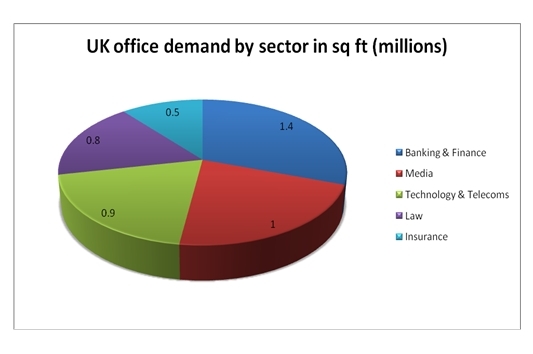 Newly identified office demand from the media sector in London was about 2.5m sq ft. The largest search was a 300,000 sq ft requirement for HQ space in London W6. Other significant searches focused on London EC1 and SE1. The technology and telecoms sector, often grouped with Media under the banner “TMT”, had a similar preference for space in these postcodes, with space in WC1 and N1 also of considerable interest. 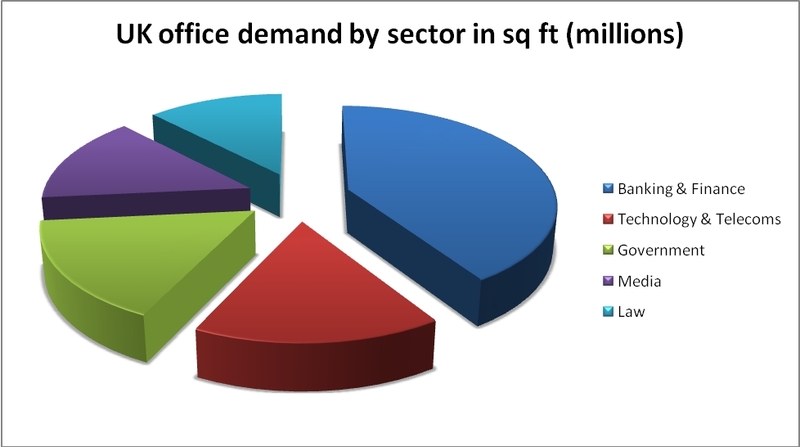 Technology and telecoms demand for London offices was just over 1.5m sq ft.
London office demand from the law sector remains strong, with 2m sq ft of new requirements identified last year. London EC2 and EC4 remain the most popular postcodes for this sector, although a significant number of 30,000 sq ft searches centered on London WC1 and WC2. There were over 40 confirmed law firm lettings last year, with 50% of firms yet to move. 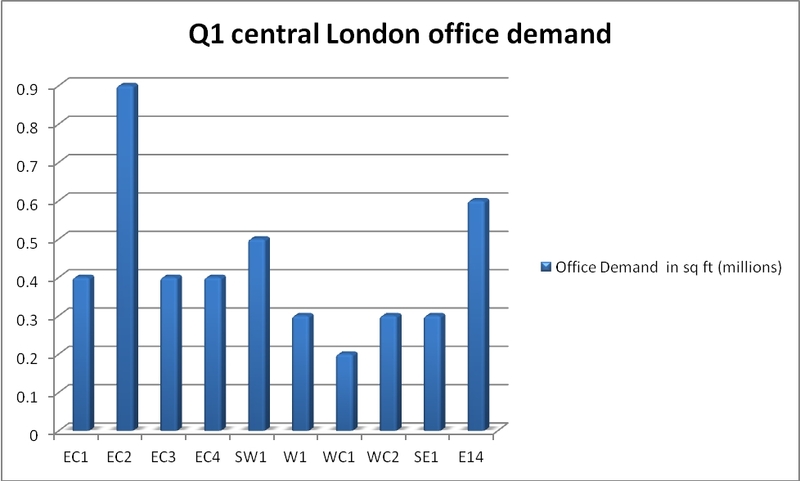 New insurance sector office demand centered on London EC3, with 700,000 sq ft of space required in this postcode last year, matching 2013 demand. Another 300,000 sq ft was required by this sector, mainly in EC2. 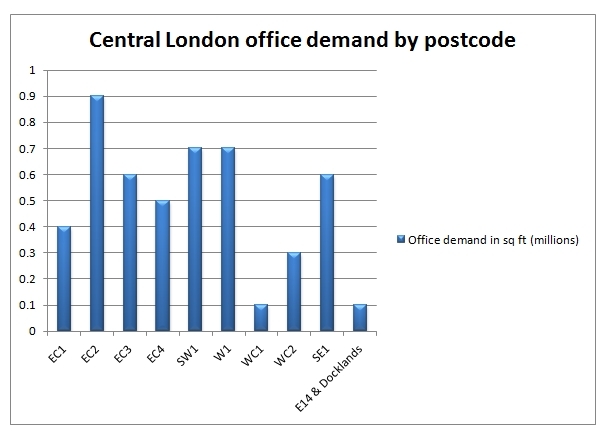 In central London, Metropolis identified just over 14m sq ft of new requirements for offices. The top 5 most sought after postcodes areas by demand were: EC2 (3m sq ft), EC3 (2m sq ft), EC4 (1.6m sq ft), E14 (1.5m sq ft) and W1 (1.4m sq ft). There is currently a healthy level of competition for good quality completed and pipeline space in central London. We expect 2015 to be another good year for London fit-out, as companies continue to occupy space pre-let in previous years. According to our research office take up in 2014 reached 12.7m sq ft, up 5% on the 2013 total. Take up in 2015 is also likely to be strong, but may not grow again by quite the same margin. Metropolis is currently tracking just over 12m sq ft of live office requirements in London and is picking up moves, on average, over 18 months before a deal is signed.